Pushing herself for Autumn Winter, Mary Katrantzou took her previous collections idea of scenic prints and complementing shapes and ran with it. Placing together a variety of prints - floral, baroque, renaissance and almost abstract – the collection had a busy feel that at the same time maintained her classic appeal. Although relying on her signature silks, this season saw her again adding in a stiffer more formed shape. Created using a thicker wool mix fabric, the results of this form and shape was effective, giving a strength and body to the show. As always, the collection was inspired by Katrantzou's passion for art and art world women. Seeing her garments as both fashion and art there is an element of the 'object' to her collections, with each piece possibly seen as a work in its own right. Detailing came through in the form of 3 dimensional attached flowers, glass beading reminiscent of antique jewellery and tasselling. With her models walking the runway to a soundtrack of Aphex Twin classics, a modern, avant-garde and artistic feel was cemented. Dazed Digital: This season saw you pull in a whole host of patterns. What was the idea behind that? Mary Katrantzou: It just sort of evolved, but yes there was a lot in there. I wanted to try and use so much pattern that it was almost as if the colour wasn't important, that the patterning took over. There was actually almost no block colour whatsoever this season. Originally it was a continuation from the last collection, I am always looking at the women around me and what they surround themselves with and then it evolved and grew. DD: Can you explain that a bit more for me? 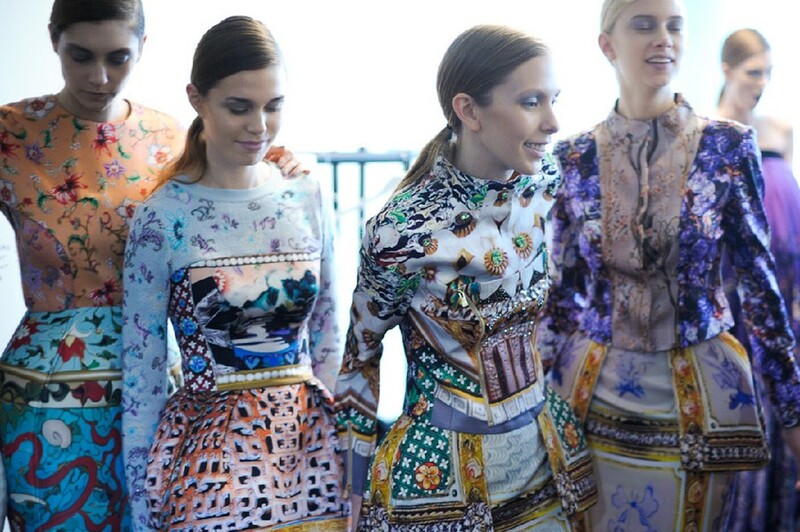 Mary Katrantzou: Yes, its about a refined culture and how people live and choose to live, with art in their lives. It became about the cultural references of that. DD: You obviously were using the printed silks again, but then you also worked in the pieces with the defined shapes. Mary Katrantzou: Those pieces are actually made from a wool mix which we then garment dyed, and of course printed. For me that was about creating layers upon layers and really pushing the boundaries of what I had done before. DD: Can you tell me a bit about the new silhouettes you were working with as well? Mary Katrantzou: Again, I really wanted to push myself and the collection forwards so I started working with volume and bigger shapes in the pieces. The structures felt more fluid to me, and from that came the idea of doing a bias cut gown. DD: Was there a thread running through the collection for you? Mary Katrantzou: Simply just to push the boundaries of what I am doing. To evolve my silhouette, my prints and my look. It was just about giving my woman something she hasn't seen me do before.